Waterfront buyers sat on the sidelines from November through March. But April, May and June produced an abundance of sales of Gig Harbor waterfront homes, closing in May through July to end summer on a far better note that it started. And sales through the end of October have actually tied with year-end of 2008. If all 15 homes that are pending close, the year will end down only 15% from 2006 and 2007. Inventory has plummeted since April. Following the subprime lending news in September and October last year, inventory of Gig Harbor waterfront skyrocketed and sales were non-existent. November through April ran a steady 9-10 year supply of waterfront properties with a nominal single property closing each of those months. May through July saw the inventory absorbed, with 12 homes closing escrow in July. July's closings swept away a lot of Gig Harbor waterfront inventory and it continued momentum, creating 21 new pendings. October has also produced two pendings on properties listed over $1million. Prices on high end homes are still trending downward. But sellers have become savvy in pricing their homes and September closings of Gig Harbor waterfront showed transactions closed at an average of 91% of the original list price. This is far better than the 78-84% differential experienced most of this year. Cash buyers have leveraged their cash and felt confident the "bottom of the market" was nearing. They purchased some great properties in the past few months-for as much as a 30% discount. Approximately 30% of homes sold in the first month of listing and over 34% sold after more than four months, the balance falling between one and four months. In September I commented the overall median price for all Gig Harbor waterfront properties this year would likely be $100,000 less than 2008, which was $800,000. That appears to still be the case with the median sales price at $690,000 year-to-date. Gig Harbor home sales start to equalize in Key Peninsula A snapshot of Gig Harbor home sales shows a nearly balanced market for Key Peninsula mailing addresses. Zip codes 98329 and 98394(Wauna, Vaughn and Key Center) have just slightly more than a seven month supply of homes in inventory. A balanced-or neutral market-is generally considered six to seven month home inventory, based on number of sales in that month. When the number drops below six months it generally becomes a seller's market. 6.3 months of inventory was normal in this area during the strong sales years of 2002-2007 so the current seven months supply is a very strong number. A high of 40 months was reached last January. Median prices are still dropping-over 10% in third quarter compared to the same period last year, with 15 closings-a high percentage of "bank-involved" sales pulling prices down. A perspective on prices over the past few years--the current median sales price--$209,000--equals first quarter 2005 when homes were selling for 99% of listed price. The median price will only increase when buyers have an appetite for something other than foreclosures and short sales and when consumer confidence is restored. Unfortunately, locally there are still many foreclosures in the pipeline. The zip codes of 98349 and 98351 (Longbranch, Lakebay and Home) have only an 8.9 month inventory of homes, based on the sales pace in September. This is looking positive for an area that experienced a 6.9 month supply of homes during the boom years of 2002-2005 but has been running double digits and a high of 49 months supply last November. The median sales price is down for third quarter by 15.4% representing 10 sales. In this area the median price has been "reset" to prices established the first nine months of 2005 when homes were selling for 98.5% of listed price. 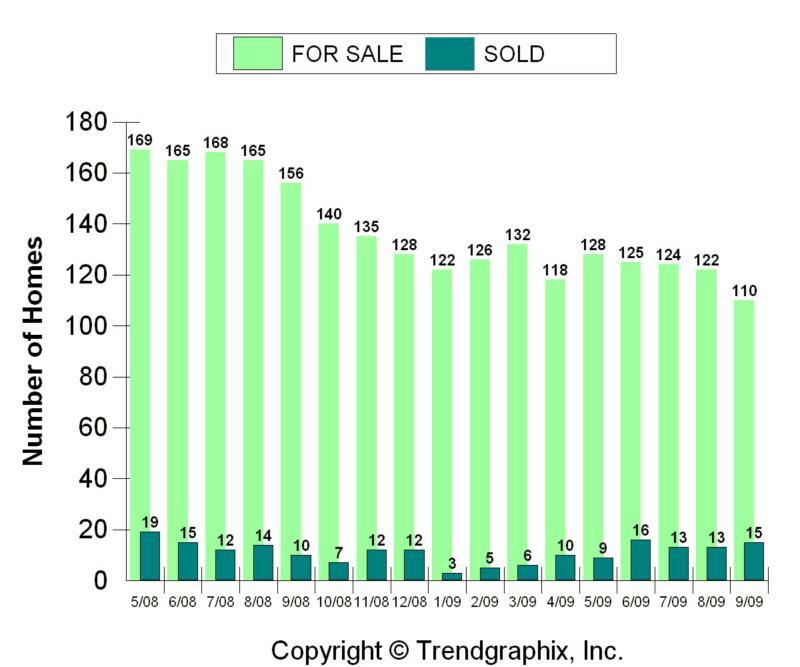 This table shows Key Peninsula zip codes 98329/98394 and 98349/98351 for Gig Harbor home sales for September 2009 and 2008. 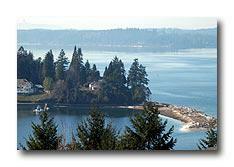 A snapshot of Gig Harbor home sales shows a nearly balanced market for Key Peninsula mailing addresses. Zip codes 98329 and 98394(Wauna, Vaughn and Key Center) have just slightly more than a seven month supply of homes in inventory. A balanced-or neutral market-is generally considered six to seven month home inventory, based on number of sales in that month. When the number drops below six months it generally becomes a seller's market. 6.3 months of inventory was normal in this area during the strong sales years of 2002-2007 so the current seven months supply is a very strong number. A high of 40 months was reached last January. Median prices are still dropping-over 10% in third quarter compared to the same period last year, with 15 closings-a high percentage of "bank-involved" sales pulling prices down. A perspective on prices over the past few years--the current median sales price--$209,000--equals first quarter 2005 when homes were selling for 99% of listed price. The median price will only increase when buyers have an appetite for something other than foreclosures and short sales and when consumer confidence is restored. Unfortunately, locally there are still many foreclosures in the pipeline. The zip codes of 98349 and 98351 (Longbranch, Lakebay and Home) have only an 8.9 month inventory of homes, based on the sales pace in September. This is looking positive for an area that experienced a 6.9 month supply of homes during the boom years of 2002-2005 but has been running double digits and a high of 49 months supply last November. The median sales price is down for third quarter by 15.4% representing 10 sales. In this area the median price has been "reset" to prices established the first nine months of 2005 when homes were selling for 98.5% of listed price. 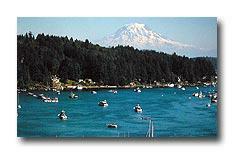 This table shows Key Peninsula zip codes 98329/98394 and 98349/98351 for Gig Harbor home sales for September 2009 and 2008. Throughout the entire Gig Harbor and Key Peninsula market area, sales for October are on track to close higher numbers than last year. Several price ranges are showing the first signs of strength in a year, namely in the low $500's and the mid $400's and $600's. Gig Harbor home sales start to equalize in Key Peninsula A snapshot of Gig Harbor home sales shows a nearly balanced market for Key Peninsula mailing addresses. Zip codes 98329 and 98394(Wauna, Vaughn and Key Center)Â have just slightly more than a seven month supply of homes in inventory. A balanced-or neutral market-is generally considered six to seven month home inventory, based on number of sales in that month. When the number drops below six months it generally becomes a seller's market. 6.3 months of inventory was normal in this area during the strong sales years of 2002-2007 so the current seven months supply is a very strong number. A high of 40 months was reached last January. Median prices are still dropping-over 10% in third quarter compared to the same period last year, with 15 closings-a high percentage of "bank-involved" sales pulling prices down. A perspective on prices over the past few years--the current median sales price--$209,000--equals first quarter 2005 when homes were selling for 99% of listed price. The median price will only increase when buyers have an appetite for something other than foreclosures and short sales and when consumer confidence is restored. Unfortunately, locally there are still many foreclosures in the pipeline. The zip codes of 98349 and 98351 (Longbranch, Lakebay and Home) have only an 8.9 month inventory of homes, based on the sales pace in September. This is looking positive for an area that experienced a 6.9 month supply of homes during the boom years of 2002-2005 but has been running double digits and a high of 49 months supply last November. The median sales price is down for third quarter by 15.4% representing 10 sales. In this area the median price has been "reset" to prices established the first nine months of 2005 when homes were selling for 98.5% of listed price. 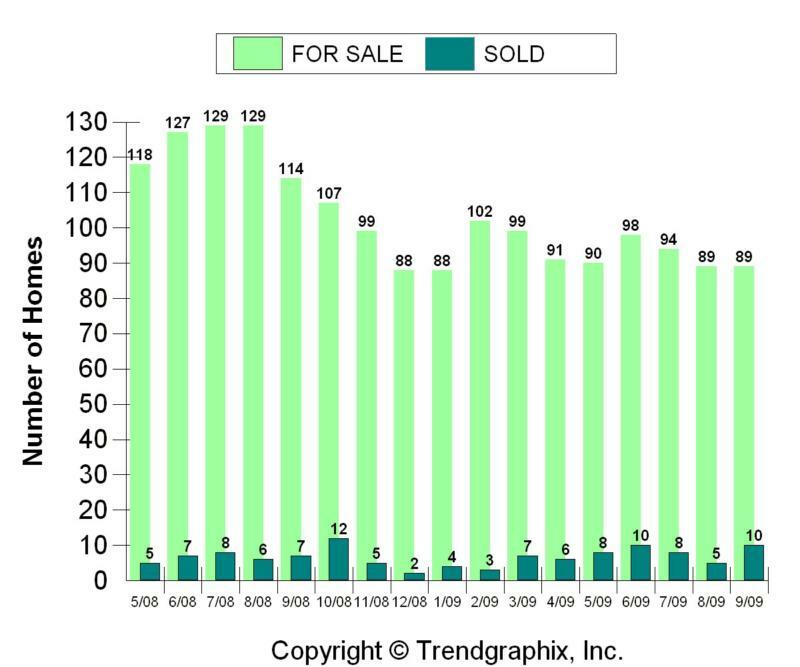 This table shows Key Peninsula zip codes 98329/98394 and 98349/98351 for Gig Harbor home sales for September 2009 and 2008.